Does Aki prefer the one note song of a varied thrush or robin’s happy refrain? She wouldn’t tell me even if I asked, which is impossible at the moment because she is off investigating a patch of grass 50 meters away. We are moving through dense alder brush on the way to the Mendenhall River. The woods hide what sounds like hundreds of birds, each singing a carnal song of spring. Aki, neutered long ago, ignores the din. I stop on a patch of trail temporality flooded with morning light and search without success for the choir. “Why,” I wonder, “Do we say we taught our children about the birds and the bees by explaining the mechanics of human procreation?” Aki and I know there are birds in these woods singing for a mate and others doing what is necessary to continue their bloodline. 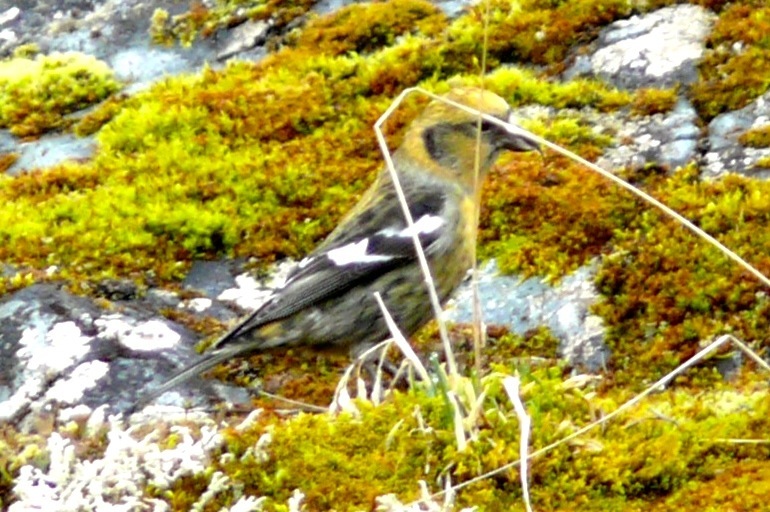 But I’ve never seen a bird, let along a bee, do it. Well, there was that time when I saw two eagles lock talons and tumble toward the ground. But trees blocked my view of their final descent so I never learned whether they consummated their love before striking the ground. 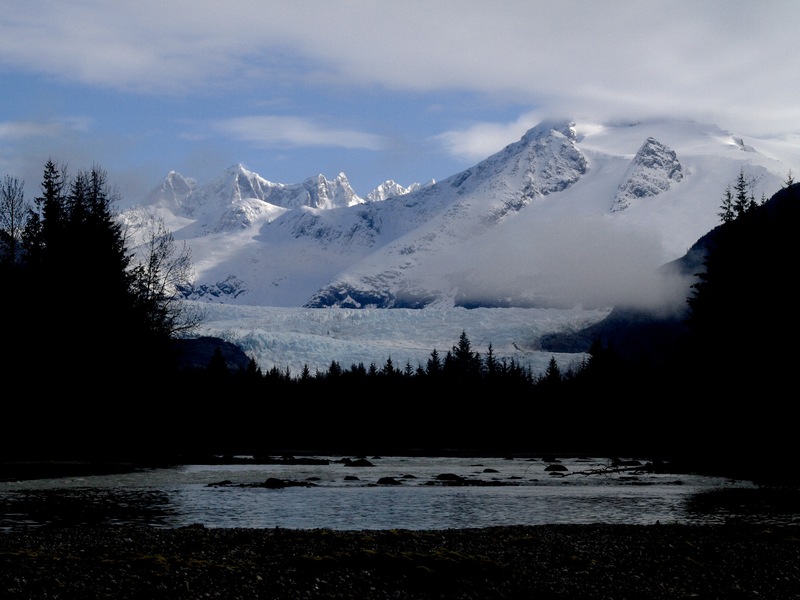 This entry was posted in Aki, Dan Branch, glacier moraine, Juneau, Nature on April 30, 2015 by Dan Branch. 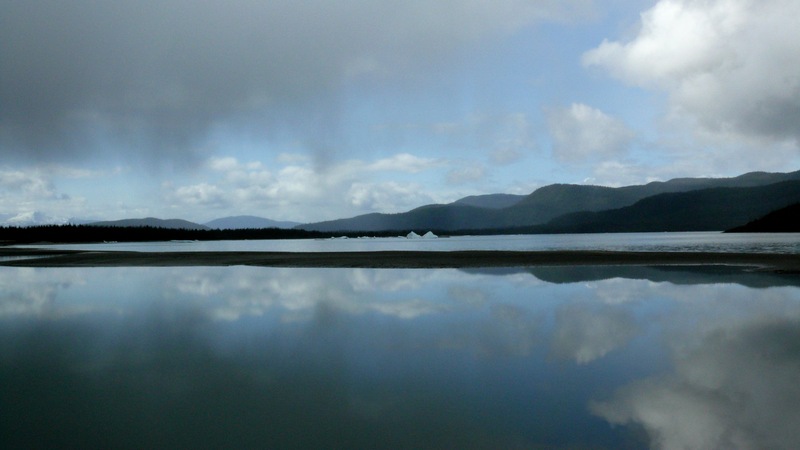 This morning, another storm sweeps through Juneau. Its rain discourages trips outside. But, I have good rain gear and a dog determined to have her daily adventure so we drive out to North Douglas where a trail meanders through protecting old growth trees. At the trail head, heavy drops slam into Aki’s fleece wrap. She gives a full body shake and trots into the woods where the spruce/hemlock canopy keeps out the worst of the storm. 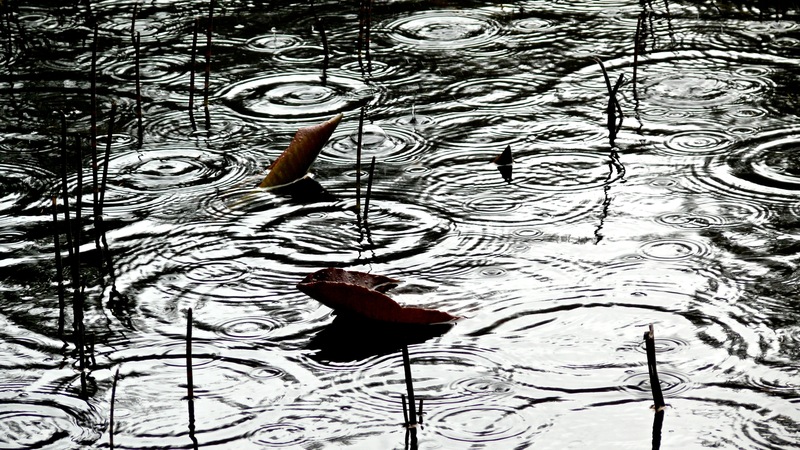 I think the rain has stopped until the trail takes us to a beaver pond where emerging water lily fronds, still infant brown, curl toward the gray sky, accepting the rain drop battering as if it were punishment from God. Crossing through more woods, we reach the beach where aggressive surf hammers the gravel. It releases a salt sea smell that we can only enjoy when a westerly stirs the fjord waters of Lynn Canal. 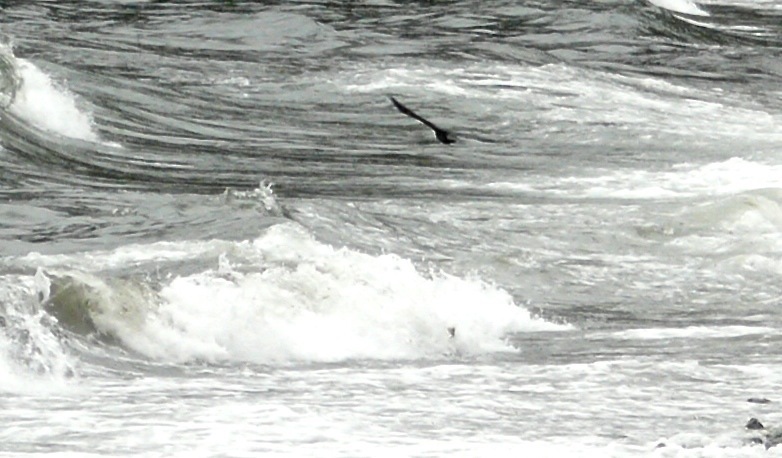 Crows stand at the tide line and stare at surf like a bloke might stare at football on TV. 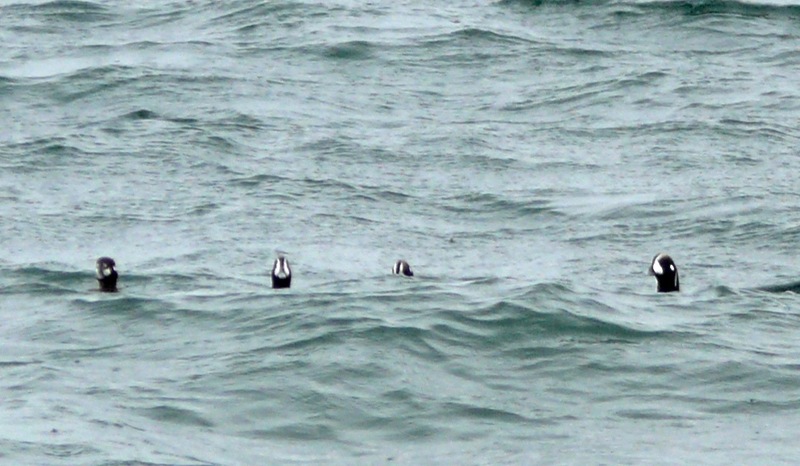 A small raft of parti-colored harlequin ducks appears and disappears in the offshore swell. Four form a line and turn to watch the little dog just before they slip behind a wave. As is always the case, they watch us and we them. 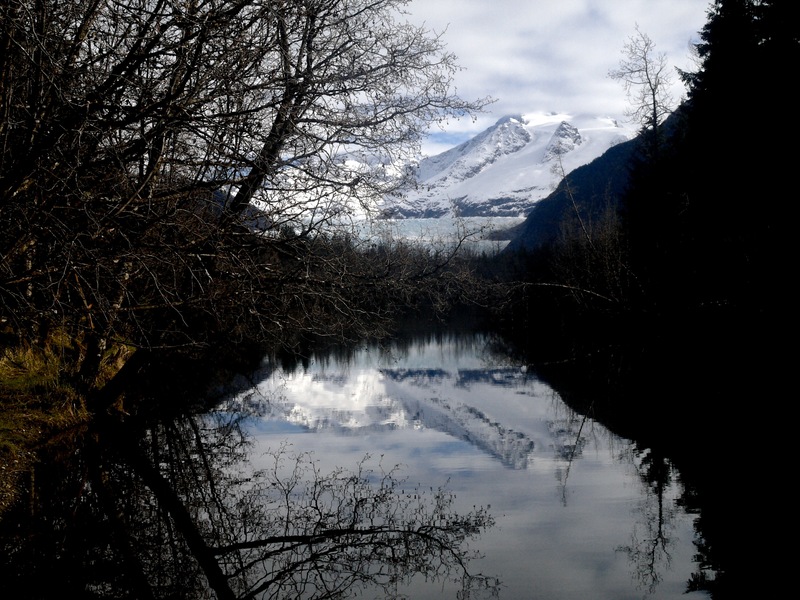 This entry was posted in Aki, Dan Branch, Juneau, Kwethluk, Nature, Southeast Alaska on April 28, 2015 by Dan Branch. A storm is moving in. Its first breaths of wind stir Aki’s curls as she dashes after her orange Frisbee. 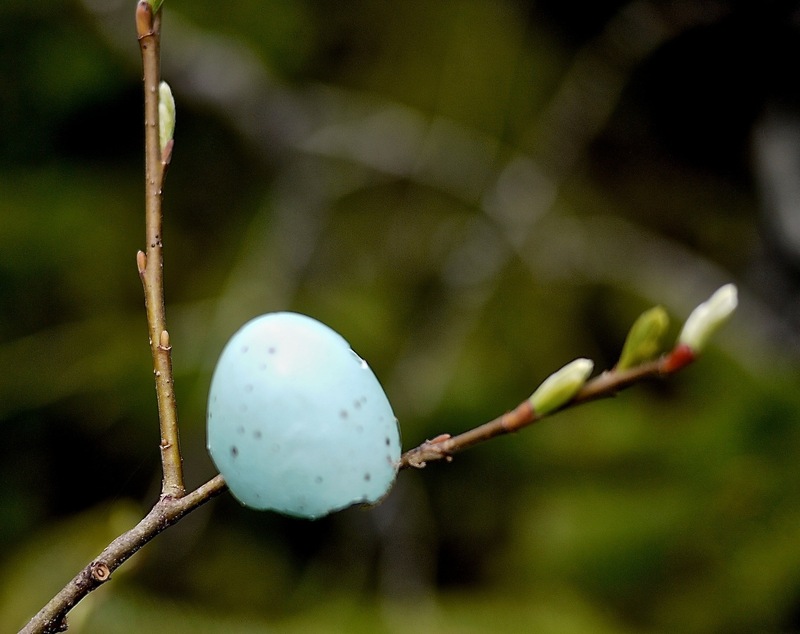 She flies by the royal blue shell fragment that rests next to the moraine trail—the top half of a robin egg shell of a shape and color that could have made it a fine wine goblet for the mouse king if not for a small hole on one side—evidence of efforts by the occupant to break into the world. Nestling it in my hand, I wonder at it’s lack of weight, how it stirs in the strengthening wind, if it protected its occupant until birth, or carried the little chick to its death. This entry was posted in Uncategorized on April 26, 2015 by Dan Branch. This morning, as we do on every walk, little Aki and I teach each other patience. Tethered together on the busy lower section of Perseverance Trail, I must stop often and wait for the little dog to sniff and mark. 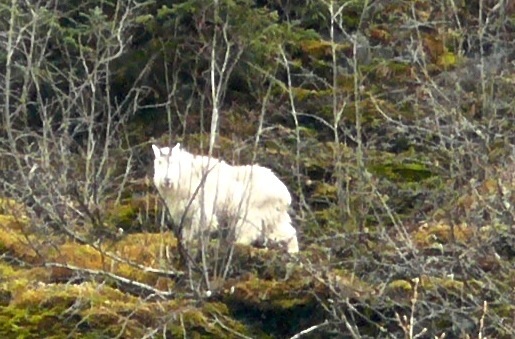 She must sit while I try to photograph three mountain goats that graze on the slope of Mt. Juneau. The goats were further down the mountain last night when we took advantage of early summer weather to walk the lower section of the trail. 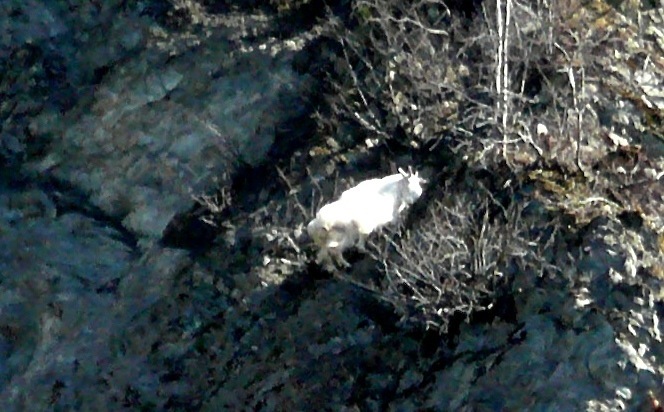 One goat feed near the base of a waterfall; close enough for me to make out its four legs and head without binoculars. Do they move down to the sweetest forage when human and dog traffic falls off at night? This morning, as a truck takes the last Mt. Roberts’ trailhead parking lot, the goats move steadily up the steep slope. Last night one goat flew from a rocky ledge. It appeared to leap, rather than fall, and sailed above a hundred foot drop at an angle that carried it behind a rock outcrop. This morning, I wonder if it’s broken body lies on top of avalanche scree. If the goat is dead, ravens and eagles would be circling above it. 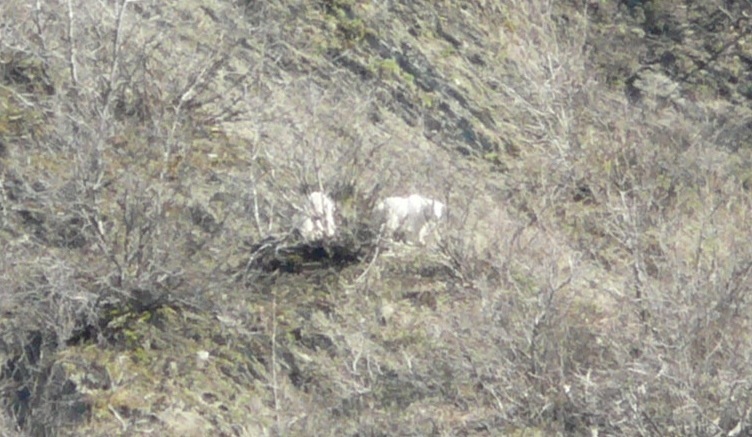 I see nothing but a goat, hopefully last night’s acrobat, feeding a quarter a mile up slope. 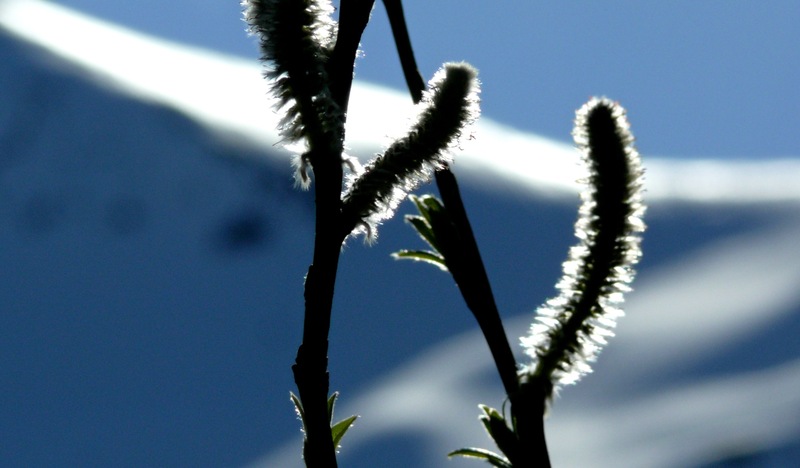 Aki, patience at an end, tugs me away from the goats and up the trail where willow catkins shimmer in strong sunlight. 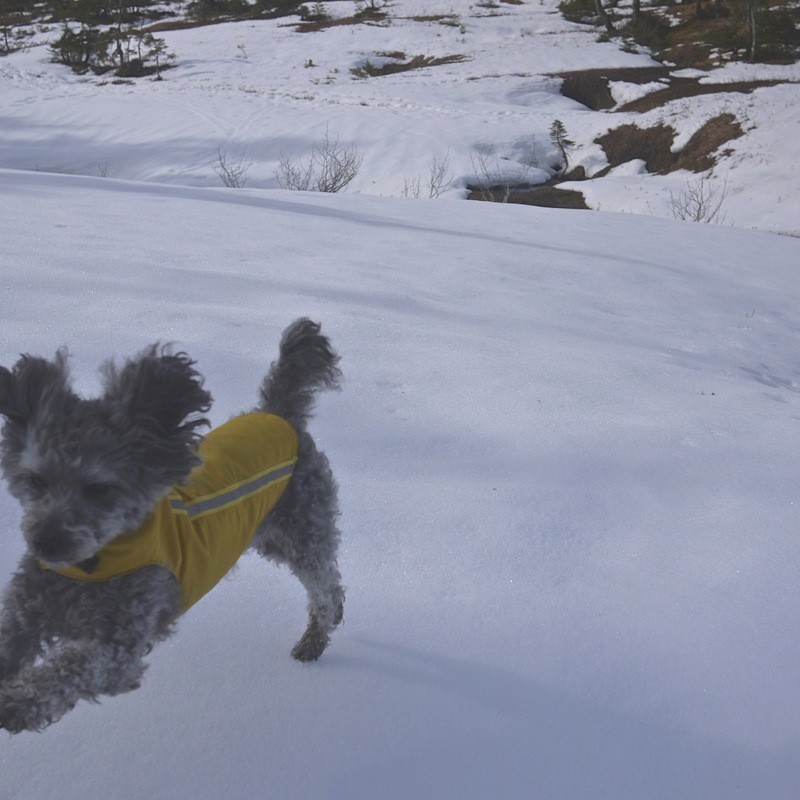 This entry was posted in Aki, Dan Branch, Juneau, Kwethluk, Nature and tagged Dan Branch, Juneau, Kwethluk, poodle on April 25, 2015 by Dan Branch. Aki and I climb a service road to a high mountain meadow that still has snow. It’s an odd morning. No one else shares the road even though its over 50 degrees and blue sky backstops mountains, each a spruce green and white quilt. There is sun but it shines through a thin pewter haze that shows no sign of dissipating. Then there is the wind, not the broad breeze that can sweep across mountain and meadow, lifting the poodle’s earflaps when she faces into it, but a wind confined like a river, to unseen channels. When we cross one of these whippy tributaries, Aki dips her head low and I use the jacket, minutes ago unnecessary in the rising heat, as shield. Powering through, the little dog and I reach a saddle covered with snow. She is hesitant to follow me onto it, as if it lay over a lightly sleeping dragon. Maybe she smells the wolf that recently left this single track toward a pocket spruce forest. When the distance between us grows to the edge of her tolerance, Aki dashes toward me. Even though I am prepared for the dash, she runs too fast for me to capture her entire body with the camera. Can the little dog read the signs of winter’s death, even in this high place? Already the rivulets run free, carrying snow melt to the sea. 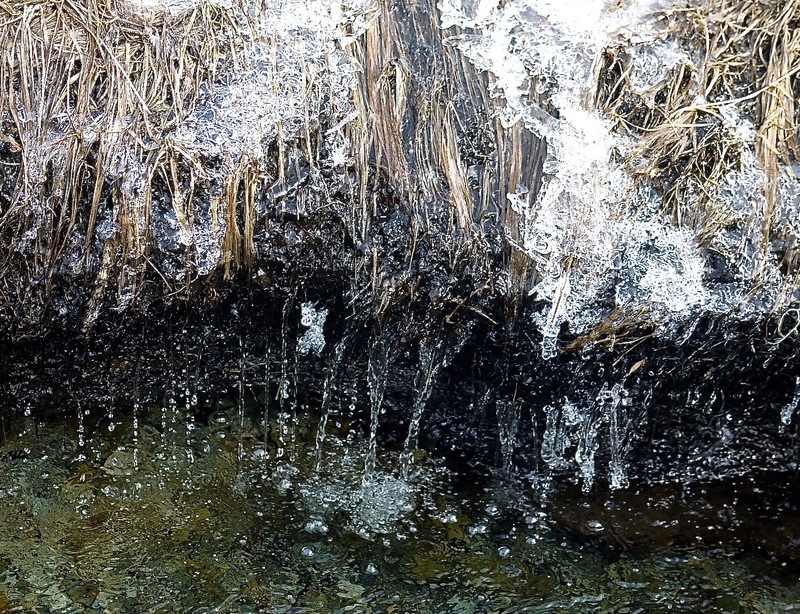 Bullet shaped skunk cabbage shoots power up through thawing ground. We can smell the decay of last fall’s grass and see the green specks of new growth pushing through it. Dash on, little dog, when this is gone, it will be all bog and biting bugs until next fall’s frosts. 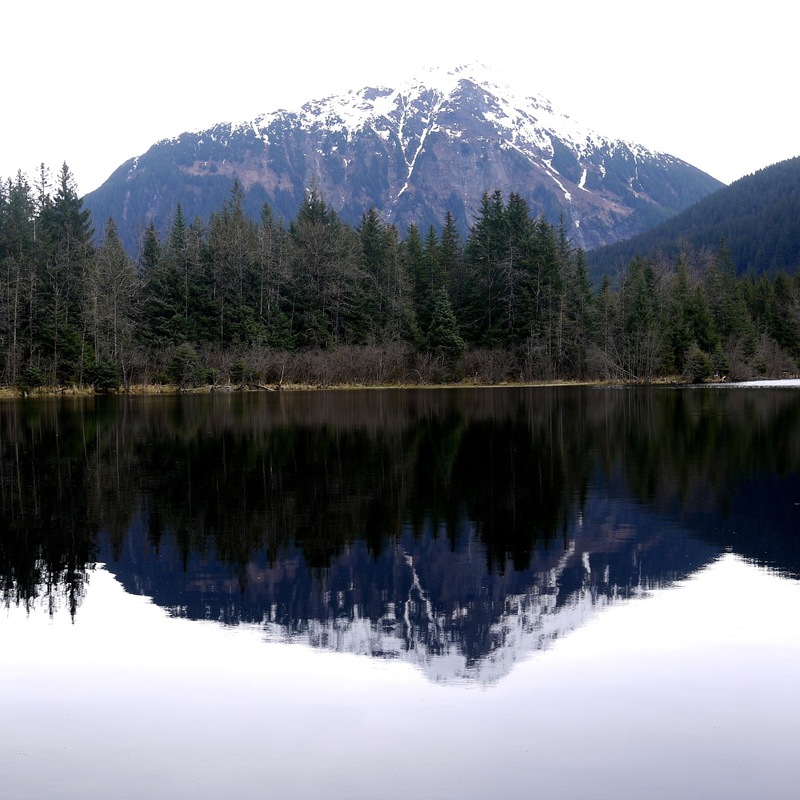 This entry was posted in Uncategorized and tagged Dan Branch, Juneau, Kwethluk, nature, poodle, Southeast Alaska on April 23, 2015 by Dan Branch. 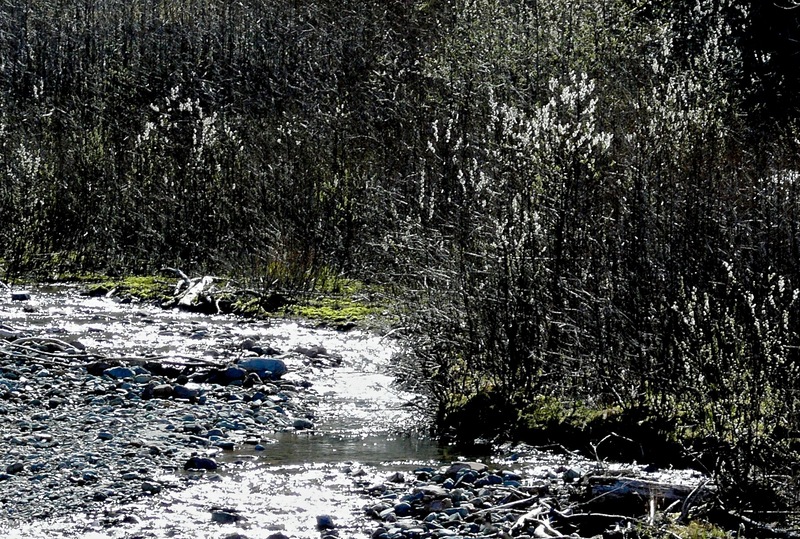 It is hard not to be trite on Earth Day, when you write about a walk in the woods. 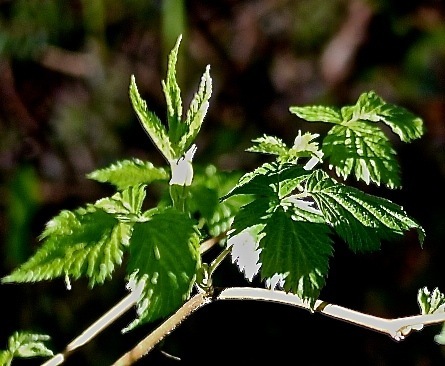 By spotlighting unfurling leaves on the forest floor, the sun makes its tough not to dance like a druid. I turn off the composing machine and let my little dog be my metronome. Exuberance can be forgiven on our first real spring morning. This entry was posted in Uncategorized on April 22, 2015 by Dan Branch. As she always does, Aki squeals and fidgets in the car as we approach the glacier trailhead. She flies out of the car when I open the door even though no dogs are near to welcome her. She must always expect wonders at the start of every hike. 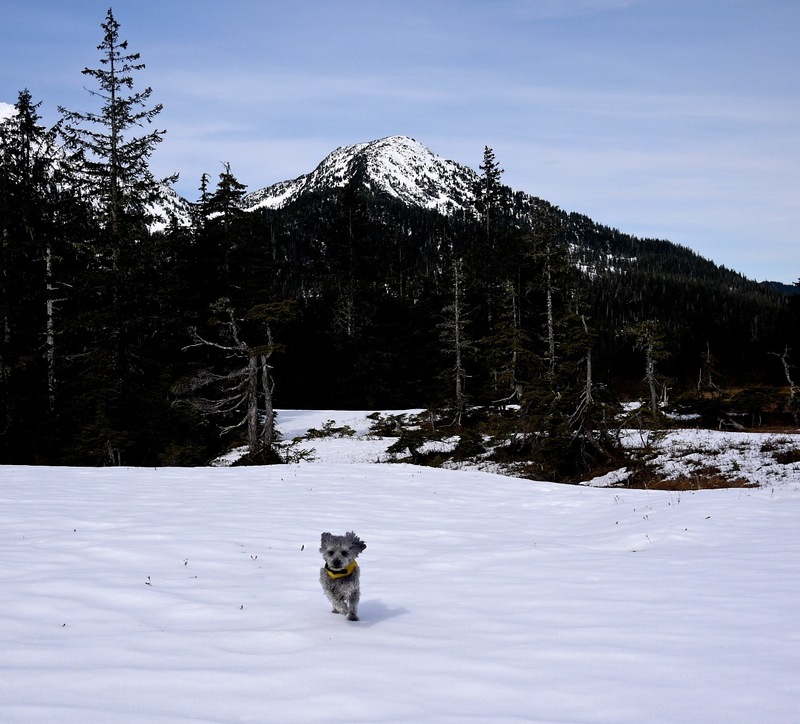 This entry was posted in Aki, Dan Branch, glacier moraine, Juneau, Nature and tagged Glacier, Juneau, nature, poodle on April 21, 2015 by Dan Branch.